A comprehensive narrative by author Bill Doolittle chronicling the controversy and recent ruling by the Maryland Racing Commission regarding Secretariat’s official time in the 1973 Preakness Stakes. The speed of the thoroughbred has been admired for centuries. But other than handicappers who make their selections based on speed figures, fans seldom pay much attention to the times racehorses record. Most of us just want to watch them run and see who wins. That all changes, though, when a once-in-a-lifetime horse comes along – with the chance at hand every time the horse steps on the track to establish another speed milestone. Such was the case with the running of the 1973 Preakness Stakes. On any other day, with any other horse, the winning time of that race would have quietly slipped into the filing cabinet of history. But this was not any other day, and not any other horse. Secretariat arrived at Pimlico Race Course, in Baltimore, Md., off a record-setting performance in the 1973 Kentucky Derby. His 1:59 2/5 clocking for 1 1/4 miles had established a new track record at Churchill Downs — the first Derby ever run in under two minutes. Many expected the Big Red Horse might just keep on rolling and lower the Pimlico track standard of 1:54, set in 1971 by Canonero II. But a track-record sweep of the three jewels of the Triple Crown was not to be in 1973 because Secretariat did not get the track record in the Preakness. Not on that day, anyway. But The Big Red Horse had another plan, and rider Ron Turcotte happily went along with the notion, as Secretariat suddenly blazed for the lead. In less than a quarter mile Secretariat rocketed from last to first, then coasted imperiously the rest of the way. Turf writer Dan Farley was stunned by the move. Secretariat’s brilliant Preakness move became a signature moment in the horse’s legacy. He had demonstrated he wasn’t just a stretch runner who could mow down tired horses, but a multi-talented athlete who could whip them just as easily when they were fresh. But as the chestnut champion sailed under the wire, the Visumatic electric timer on the infield tote board revealed a winning time of 1:55 that was NOT a new track record. Though a good time, Secretariat’s 1:55 for 1 3/16 miles was a full second slower than Canonero II’s mark. Not that anybody was let down. In the winner’s circle, the Secretariat team was in full celebration, with a huge throng at Pimlico cheering the newest American sports hero — a horse! But up in the press box another story was unfolding, and what followed turned into one of the more bizarre controversies in American sports history. Robinson and Schwartz were racetrack pros — the kind of guys who went around life with stopwatches in their palms. Each had timed thousands of races and zillions of morning workouts. Watching the Preakness from different vantage points, each routinely clicked off Secretariat’s Preakness. The track’s official time was recorded by an electric timer that worked like an electric eye — with the timer started, and stopped, by a horse breaking a beam of light across the track. A difference of a fifth of a second or so between a hand-timed clocking and an electric timing would have been understandable. But this was 1 3/5 seconds difference. A Grand Canyon gap of time. Translated into distance, for a thoroughbred running at more than 30 mph, 1 3/5 seconds represented perhaps eight lengths on the track. Maybe 50 feet! It was not an easily resolvable dilemma. On one hand, the experience of the clockers in separating racehorse times into fifths of a second was undeniable. But the science of a modern electric timer was indisputable. And the Pimlico Visumatic timer had no previous record of malfunction. In fact it had worked just fine in all the other races that day. At that time, CBS broadcast the Triple Crown series, and the big eye network challenged the electric eye of the Pimlico timer. In the days following the Preakness, CBS aired videotape of the race timed manually and electronically, and in every instance Secretariat required 1:53 2/5 seconds to win the Preakness. Not 1:55. The Form’s disagreement with Pimlico’s time was one thing, but when CBS got involved, the argument was suddenly brought before a national court of opinion. One of millions captivated by the story was Marty McGee. McGee would grow up to be a top reporter for the Daily Racing Form, but in 1973, he was an eighth-grader in elementary school, glued to the family TV, following the story. A special meeting of the Maryland stewards was called and CBS producer Sandy Grossman took the stand as the star witness. Grossman ran the tape of Secretariat’s Preakness on a monitor and asked the Form’s clocker to time it. Watching the replay, Robinson again clicked off a time of 1:53 2/5, as he had on Preakness Day. That was pretty convincing. But it must be remembered that in 1973 videotape was a fairly new technology, not accepted absolutely as it is today. People DID have faith in an electric eye, however. That was proven science. But Grossman then showed a split screen, with a tape of Canonero running his 1971 Preakness on the top half of the screen, and Secretariat running the 1973 Preakness on the bottom half. Secretariat won. In the end, however, officials recognized NEITHER the Visumatic clocking of 1:55, nor the Form’s 1:53 2/5. Instead, Pimlico said its own human timer, E.T. McClean, had hand-clocked the race in 1:54 2/5, and that would become the official time. Canonero kept his track record. The Preakness time question came up again in 1999. The racing commission decided not to change the time, though the board noted it would consider a change if compelling new technical evidence emerged. The ruling also left things pretty much as they were in the court of public opinion. And in the horse world. Farley, now with The Racing Post, summed up the story at that time. Over time, the controversy over Secretariat’s Preakness clocking had settled to a mere oddity of sports history, like a questioned call by an umpire, or a boxing decision long disputed. In fact, the unusualness of the event almost added more to Secretariat’s mystique than if the electric timer had simply recorded a new track record. But diehards knew in their hearts that the Big Red Horse broke the track record that day, and the Preakness time story remained ever a part of sports lore. Now the diehards have seen their faith vindicated. Compelling new technical evidence did emerge, and racing authorities acted. At special meeting of the Maryland Racing Commission, on June 19, 2012, Secretariat’s 1973 Preakness time was officially changed to 1:53 – meaning the horse did, indeed, break the Pimlico track record that stood at the time, and had, in fact, captured all three jewels of the Triple Crown in record time. And all three remain Triple Crown records. (Secretariat won the Kentucky Derby in 1:59 2/5 for 1 ¼ miles, Preakness in 1:53 for 1 3/16ths; Belmont in 2:24 for 1 ½ miles – which was also a world record.) The new Preakness time was established by experts employing digital timing processes that were unknown 39 years ago when Secretariat made his spectacular sweep of the American Triple Crown. 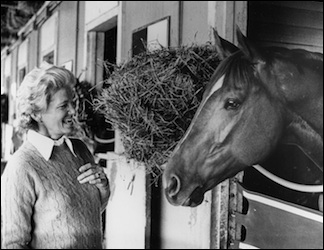 The Maryland commission, responding to requests from Penny Chenery, owner of Secretariat, and officials of Pimlico Race Course, heard more than three hours of testimony before making its historic ruling. Leonard Lusky, the president of Secretariat.com, represented Chenery in the appeal, and led the presentation to the commission. Lusky assembled a witness list that included a panel of experts from the racing world and the video technology sector, including: Karin DeFrancis, former owner of Pimlico’s Maryland Jockey Club; Jack Harmon, the current official clocker in Maryland; Amy Zimmerman, executive producer of the HRTV horse racing network and producer for all three 2012 Triple Crown telecasts; Jamie Pence, president of Videobred Productions and a widely regarded video editor specializing in post-production technology; Wyndham Hannaway, a nationally known forensic film and visual imaging specialist; Sandy Grossman, the acclaimed CBS director who had also testified at the original hearing 39 years before; and Thomas Westenburg, a US Olympic Committee engineer who specializes in the analysis and accuracy of electronic timing systems. “Chenery’s spokesman, Leonard Lusky, slowly built his case by calling on a former CBS director and video experts from Kentucky and Colorado to testify that tape of the 1973 race had not been doctored and indeed reflected real time. Digital technology allowed them to break down the film frame-by-frame and create a comparison to other Preakness races. “When Lusky finally showed three videos on the screen at once, stacked, the only immediately discernible difference was the quality of the film. The top block showed Louis Quatorze’s win in 1996, timed in 1:53 2/5. The middle block showed Tank’s Prospect’s 1985 victory, also timed in 1:53 2/5. The bottom showed Secretariat’s run. Though the productions used slightly different camera angles the races clearly unfolded in unison. Chenery, who resides today in Colorado, but is often in attendance at the sport’s classic races, says she approached the time change appeal delicately, trying not so much to brand the original decision as wrong, but to utilize modern scientific methods to get the race time right. The lead videography editor and consultant called in to assist the Secretariat team with the presentation was Jamie Pence. Pence worked with Lusky to verify and accurately recreate all existing conditions of the 1973 race, establishing the existing CBS video footage as accurate and untampered with. Videobred editor Eric Steman carefully assembled the video evidence and produced the final presentation for the racing commission meeting. Which would make it very precise, indeed, considering there are 29.97 frames per second in the CBS video – and an astounding total of 3,391 frames for the race. That’s a blur to the human eye – a little more than three one hundredths of a second per frame to be precise. But a snap for today’s high-speed computers. After that, it was just arithmetic. Doing the necessary division, Pence came up with a time – and he can rip off that number by heart now – of the race as 1 minute 53.14647981314646 seconds. Pence, who gave his testimony to the commission by “Skype,” from Louisville believes the most compelling aspect of the visual presentation is it is understandable. Videobred used modern on-screen aids to help the viewer. Pence says the entire experience was fascinating. And thrilling, too, for a Kentucky boy who grew up hearing the names of famous horses like Secretariat spoken in reverential tones. Lusky told New York Times writer Victor Mather that when he started the project, he assumed he would be trying to show that Secretariat was the first to run the Preakness distance in 1:53 2/5 — a time also later posted by Preakness winners Tank’s Prospect, Louis Quatorze and Curlin. He thought that’s what the racing commission assumed, too. But on the day of the hearing when he told the panel that the actual time might be even faster, there was an audible hush in the room. The tape was played, and history was changed. How was the time recorded incorrectly in the first place? Nobody will ever know. But the mistake seems to have come in the first “fractional” time recorded of the race by the Visumatic timer: 25 seconds. That’s the time that differs most radically from the video produced by Pence and the clockings made that day by the Daily Racing Form. Maybe a bird flew across the electronic beam before the horses got there. Maybe it was a piece of paper wafting by. Or a human standing too close to the timer accidentally trips it early. Nobody will ever know. But many knowledgeable horsemen feel that 25 seconds for the first quarter mile is out of line for top horses, which normally will clip that distance off much more quickly. That’s what Secretariat’s jockey Ron Turcotte thinks, too. They say the top jocks have a clock in their heads, and Hall-of-Fame rider Turcotte says his “clock” wasn’t even in the same time zone with the Pimlico timer. Lusky says he understands that the lofty status of Secretariat and respect for Chenery, as well as the historical significance of the Preakness Stakes, may have helped motivate the racing commission to take another look at the longtime controversy.